1 Thessalonians 5 [5.] You are all children of light, and children of the day. We don’t belong to the night, nor to darkness, so then let’s not sleep, as the rest do, but let’s watch and be sober. For those who sleep, sleep in the night, and those who are drunk are drunk in the night. 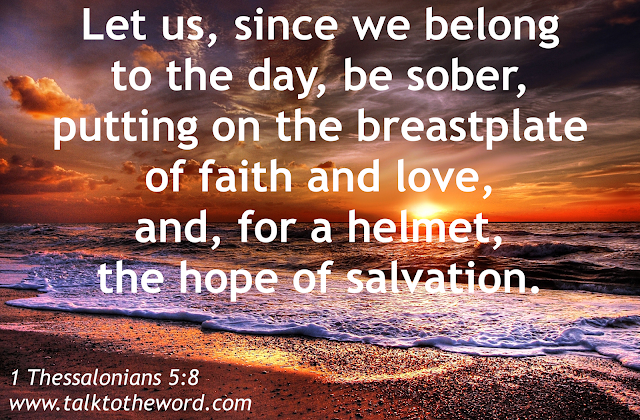 But let us, since we belong to the day, be sober, putting on the breastplate of faith and love, and, for a helmet, the hope of salvation. For God didn’t appoint us to wrath, but to the obtaining of salvation through our Lord Jesus Christ, who died for us, that, whether we wake or sleep, we should live together with him.